Have you ever tried making noodles from zucchini or any other vegetable? Right now, I’m really finding out just how delicious these veggie noodles can be! Now don’t get me wrong, I enjoy regular pasta just as much as the next person, but I’d rather not eat it too often. But sometimes you just want pasta, and this dish will have you swooning and going back for seconds. There is something truly satisfying about knowing exactly what your noodles are made of. I have found that veggie noodles can easily substitute spaghetti, fettuccini, and even angel hair pasta. They’re fresh, flavorful, and nutrient dense and taste so good, you juuuuust might forget about those other “empty-carb” noodles. Zucchini noodles are super simple to make, all you need are a few zucchinis and a spiralizer ! Alright, so first things first, carefully cut a medium sized butternut squash down the middle, scoop out the seeds, and then pop it in a 375 degree oven (face down) for 45 minutes to an hour. While we’re waiting it’s time to make the zucchini noodles. To make the zucchini noodles for this recipe, start out with fresh, firm, preferably organic zucchini. Clean them under running water and then cut the ends off. Next, run them through your spiralizer (this one is my favorite because you can make many different kinds of noodles with the least amount of waste). I have also used this one and this one with good results. I used about 4 good sized zucchini and I’d say these made about 4-6 servings worth of noodles. Once your noodles are made, set them aside for now because it’s time to make the best sauce you’ll ever taste! 1. While the butternut squash is cooking, sauté one medium yellow onion (until translucent) and 3-4 cloves of garlic (until fragrant) and then set aside. 2. Once the butternut squash is fork tender, scoop out all of the flesh once it’s cool enough to handle. 3. Pull out your Vitamix , Blendtec , Food Processor , or other blender of choice and throw in all of the butternut flesh, the onions and garlic, a large pinch of dried rosemary or Herbes de Provence , 1 can of FULL fat coconut cream , ¾ tsp of sea salt , a hefty crack of fresh black pepper , and a splash of bone broth or chicken stock. 4. Blend everything until smooth. 5. Now it’s time to heat up a skillet with coconut oil (I like this one ) or butter and begin pan frying the noodles. 6. You want them to be juuuust cooked through. If they create a lot of liquid, now is the time to remove it or your sauce will be to runny (I just use a folded paper towel). 7. Once the excess liquid is removed, add in the sauce with the zucchini noodles and sauté until hot. This looks delicious! I love zucchini noodles and creamy sauces. Sounds delicious! I need to get a spiralizer. Such a fun meal. 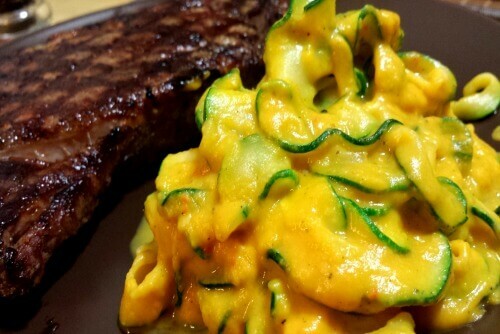 I love zucchini noodle… and squash. Will definitely try this. This recipe looks amazing, love the coconut cream! We’d all love this; and it’s perfect for my dairy-free daughter. Fabulous! Love zoodles and love BNS! Greta combo!